According to recent Roy Morgan Research, printed catalogues are the most useful media when purchasing groceries at 47 per cent, a clear winner over other mediums including the internet at 25 per cent. Online advertisements are under fire from marketers today as they justify their cut-through and with research showing them getting lost in cyber, catalogues act as a physical and silent disrupter that connects consumers to brands and launches them into action. The main grocery buyer makes at least two trips to the shops every week and catalogue’s brand reinforcement plays a significant role in this. The channel is crucial in aligning consumers with supermarket retailers firming up loyalty divides. Research reveals that Australians are conscious shoppers too and with the main grocery buyer spending on average $182.24 a week on their food shop, sales are a priority. Nearly 65 per cent of Australians consider low prices a top 5 factor when choosing their supermarket, and 47 per cent go out of their way in search of a bargain. The modern-day consumer is more aware of what they eat with 58 per cent of Australians not buying genetically modified food if they can help it. Consumers are hungry for sales and catalogues deliver. Retailers are tapping into readership and constructing the layout to accommodate for all main grocery buyers, including those in search for the healthiest ingredients, to those embracing a cheat day. What is key to this channel? The number one must do? Frequency. The more frequent the distribution, the stronger the brand recall. Nearly eight million Australians read a supermarket catalogue every week, and out of that eight million, more than half (5.4 million Australians) bought from a catalogue within the last seven days. Weekly tabloid catalogues produced by supermarket giants such as Woolworths, Coles and ALDI inform consumers. Information about sales are guaranteed to show up at their doorstep every week reinforcing value, range and brand reliability. Supermarket retailers use frequency to remind and entice consumers in store and it works. ALDI’s Special Buys catalogue is clearly using the strength of this channel becoming the dominant winner of catalogue readership with 80 per cent reading their catalogue in the last 4 weeks, followed by Coles 72 per cent, Woolies and Foodland at 71 per cent and IGA with 66 per cent. ALDI’s weekly catalogues are a strong platform for the retailer to connect with consumers to reinforce brand equity and increase their path to purchase journey. Supermarket retailers are also taking an extra step with their catalogue marketing to increase engagement with their brand. Coles’ self-titled magalogue (a catalogue and magazine hybrid) supplies consumers with not just the sales, but also knowledge on hero products. Through recipes for the seasons, and budget saving options, the magalogue has proven to be a huge success resulting in an increase in its monthly print run to 1.6 million. Their monthly magalogue, in addition to their weekly catalogue distribution, positions Coles as an approachable friend by offering consumers more value to the brand through recipes, than just what’s on the shelves. 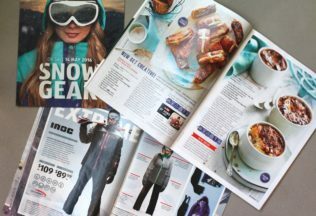 Australians rely heavily on printed catalogues to inform theirs purchasing decision, from what to buy and where to shop. With catalogues being delivered to consumers’ doorsteps, catalogues have the ability to be read and reread positioning them as a powerful tool that should not be overlooked.